On 18 October 2018, the Unrepresented Nations and Peoples Organisation (UNPO) and its member organisations the World Uyghur Congress (WUC), the Southern Mongolian Human Rights Information Center (SMHRIC), in collaboration with the International Campaign for Tibet, organised a demonstration outside of the European Commission in Brussels. In occasion of the 12th ASEM (Asia-Europe) Summit, the Uyghur, Tibetan and Southern Mongolian communities took to the streets to call upon EU leaders to hold China accountable to the deteriorating human rights situation in China. Over the past years, the human rights situation in China has deteriorated significantly. Particularly ethnic and religious minorities are being persecuted by Xi Jinping’s policies. Under the false pretext of ‘counter terrorism’, racial profiling, mass surveillance, arbitrary arrests and mass internments have become common practice. Although minorities have been fighting for years to secure their basic human rights, China has only increased persecution. The ASEM Summit is an intergovernmental process between a number of European and Asian Countries, as well as the European Union. The Summit addresses political, economic, and socio-cultural issues of common interest and seeks to improve cooperation and mutual understanding. The summit is therefore an exceptional opportunity for EU leaders to pressure China on its horrific human rights record. 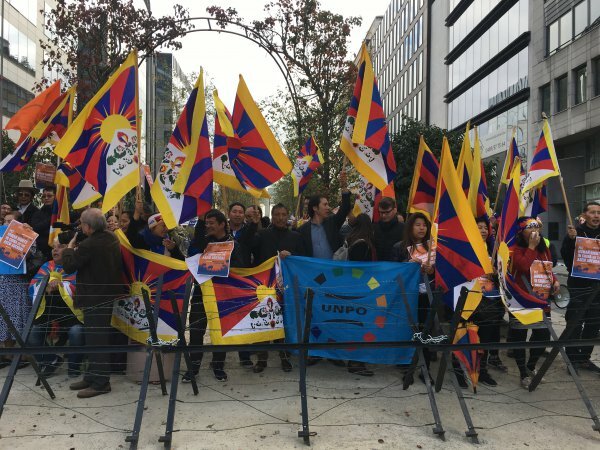 Protesters representing minorities and communities affected by repressive Chinese policies gathered outside the European Commission in Brussels. Colourful flags decorated the demonstration and chants in several languages created a powerful and inspiring atmosphere. Representatives from UNPO, WUC, SMHRIC and the International Campaign for Tibet held speeches, calling on the EU to recognize the atrocities of the Chinese Government and to adhere and reaffirm to our shared values of human rights, democracy and the rule of law. In a speech by MEP Thomas Mann, he called for solidarity and underlined the importance of continued efforts of the European Parliament in pressuring China to adhere to human rights. Demonstrators chanted slogans, calling on China to stop killings, internments and persecution of minorities.